Caption : HYDERABAD (AP/ BL) -21-03-2011- WATER FOR EVERY LIVING BEING : It is estimated that every year, 1,500 cubic kilometres of waste water are produced globally. While waste and wastewater can be reused productively for energy and irrigation, it usually is not. In developing countries 80 percent of all waste is being discharged untreated, because of lack of regulations and resources. And population and industrial growth add new sources of pollution and increased demand for clean water . Human and environmental health, drinking and agricultural water supplies for the present and future are at stake, still water pollution rarely warrants mention as a pressing issue. 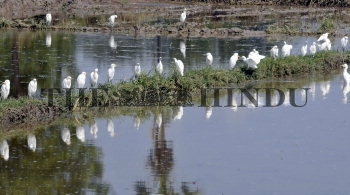 'World Water Day' is observed across the globe on March 22 as egrets flock around a patch of wetland on the Warangal -Hyderabad Highway. PHOTO: P_V_SIVAKUMAR .